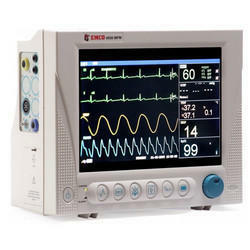 Our product range includes a wide range of patient monitor five channel - contec and patient monitor. CMS8000 has abundant functions that can be used for clinical monitoring with adult, pediatric and neonate. 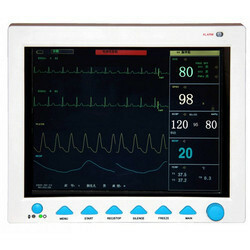 It adopts 12.1 color TFT LCD displaying real-time date and waveform. A patient monitor is an electronic medical device that consists of one of more monitoring sensors, a processing component(s), and a screen display (also called a "monitor") that provide and record for medical professionals a patient's medical vital signs (body temperature, blood pressure, pulse rate and respiratory rate) or measurements of the activity of various body organs such as ECG monitors. EMCO Meditek Patient Monitor are manufactured indigenously with foreign technology obtained from leading Medical Equipment Manufacturing companies around the world especially USA and Europe. USB port for saving Offline Memory.